My son Alex is 7 years old and like most boys his age he loves lego especially ninjago. His favorite is the green ninja so thats what he wanted to be for halloween. I couldnt find the costume anywhere so my son asked if I could make it for him...I had no idea how I would make it since I had never made a costume before but I just didnt have the heart to say no. I started with some cardboard boxes for the body, when I was happy with the shape I cover it with fabric and pieced the details on the front with fabric. The head is also made with cardboard and the details are made with foam and then covered in the same fabric (this was the hardest thing to make I had to cover it twice) the legs are cut out of foam and covered in the same fabric. His hands and weapon are also made with cardboard. I regret not taking pictures of the entire process. He was a huge success in school, everyone wanting to take pictures with him and chanting "ninjago ninjago" as he walked by in the parade. We also went to legoland and got amazing compliments from people, my son had camaras flashing from every direction. Someone even said they thought he was a park character. Every second spent working on this was worth it when my son tells me "you're the best mom in the world" and I see how happy he is in his costume grabbing everyones attention. Thats the best thing for me. IS THIS AN ADULT COSTUME... IF SO I WANT ONE IN RED! Amazing work. The creator has TALENT. I love the costume and I want one. Very nice costume I love it . love this costume. best costume. WOW this looks so official!!! I swear it looks like it was made from lego themselves, i mean it blends perfectly with all the ninjago merchandise in the back, I would totally buy this!!!!! great job!!!! We love the costume , and yes he was the very popular in our school parade one of the best ,great job mom making the costume :-) and Alex good luck :-) . #1 that is for sure. I love this costume! How original! It is DEAD ON!!! Great job, Lego Mom, and good luck to Alex!!! i love it so cool! it looks so real. omg im in love with this costume i want one! This is the greatest thing since dominos reinvented the pizza!!!!! super cool costume! awesome job! Jump up, kick back, whip around, and spin! Such an amazing costume! Great Job! definitly deserves to win! greatest homemade costume Ive ever seen. Very clean, and professional look. makes me want to learn SPINJITZU! good luck I hope you win. Best costume I've seen for sure !!! super cool costume!!!!!!!! 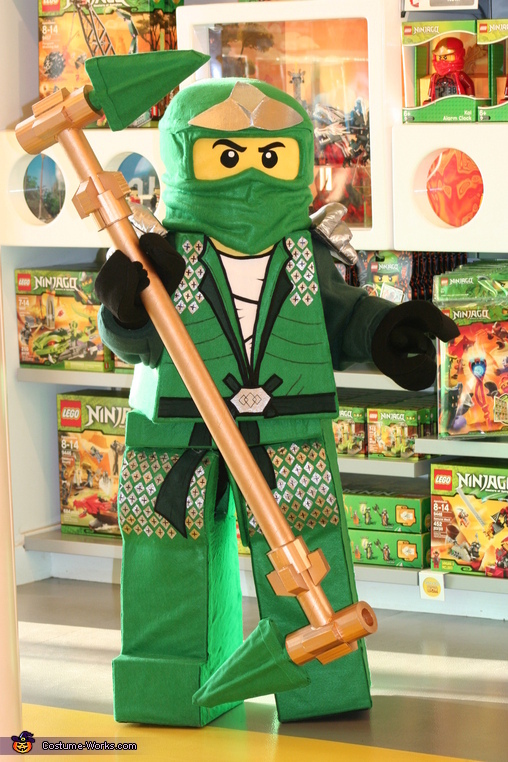 ive looked at all the other lego ninjago costumes and this is the best. lego should hire you to make their costumes. great job and good luck. Can't be beat! It's a winner!!! All I can say is "wow". It looks like an advertisement out of a lego catalog. Those are some serious skills you've got. Awsome Costume!! it was a huge success at our school!! the best one ive seen!! winner hands down!! mommy made it with lots of love thats why it deserves to be the WINNER!! lots of time and hard work!!! Th is is a wonderful costume! You did a fantastic job! 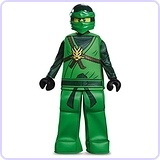 My son wants me to make a Ninja Lego costume and when I did some searching I came across yours. I was just wondering if you child could sit in this costume? sherry thank you for your comment. My son was able to sit in this costume. we had to help him sit and help him get up but it can be done. So darling! I really want to make this for my son. I'm a graphic designer also and would love the challenge. The only I can't wrap my head around in the head! Yipes. Cardboard and foam? Did you hot glue the fabric to the styrofoam? I thought it would melt? I would love any help I can get. I was going to start this week, knowing it would be a process. Amazing work! Believe it or not, my 7yr old girl wants to be Lloyd for halloween this year. If I give you my email, would you be willing to send more pics of the pieces and/or answer a few questions? I showed my son this picture and he loved it!! He wants to be this for Halloween and this has certainly inspired me to go the extra mile. I think I understand all that you did, but was wondering if your son could see through the helmet? If so, how? Mesh eyes? Amazing job...hoping I can do my son's costume justice!! How did you make the head?? Do u still have this costume? Can I buy it from u? Lori, I do have the costume. We dont want to sell it. I'm sorry. Thank you for your offer. 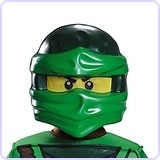 Fantastic - i would love to make A White ninjago for my son, but i can't figure out How he can see through the helmet. Can you help me with that ? I cut the eyes out and covered them with pieces of black stockings, then painted the white circle. There's a lot of different see through fabrics you can use. I used what I had on hand. what did you do to get the mask to make the fabric look gathered under his mouth? Leann. I used cardboad and foam. I shaped the foam and then covered it with the fabric. Its hard to explain without pictures. Thanks so much. That gives me a good idea. Is it just a cotton fabric that you used? I used felt. It was on sale and I was able to buy it by the yard. You can use any fabric you want really. kiubo siboney espero y esten bien. Great costume what material did you use for stars and shoulder pads? Could you send me directions on how you made this costume? This is totally awesome. If you have them, I would love instructions as well. Sorry! I don't have instructions on how to make this costume. It's the first costume I made, so I made it up as I went. I regret not taking pictures of my process. HEY SIBONEY, ECHAME UN CABLE. NO TE ME PIERDAS AMIGA. Siboney hi can you email on any instructions that can be helpful in making this for my son. Hi Siboney can you please email any instructions or what you used to make the body and shoulder pads and the stars please email me my son wants to be this for Halloween because the ones at the stores look nothing like a ninjago please thank you in advance. Hi Siboney thanks for the response i forgot to mention..How did you make the head? Did you make the arms as well? I am going to give it a shot. Diane the arms are made like a regular sleeve. The head is tricky to explain because it's a mixture of so many different things. I just started with a cylinder shape and added foam where I wanted the raised details and the covered the entire piece in the fabric. Casey the back looks just like the back on the minifigure. Sorry I don't have pictures of the back. I don't have easy access to it because it's in storage so I can't post more pictures of it. What a great costume! You did an awesome job! I found this while looking for ideas for this yr. my boys want to be the green and red, I'm the blue and dad is Sensei Wu. One question. The legs, did you sew them or glue the fabric to the foam? Thanks for any help!! His name is Lloyd, he's called the Green Ninja. Siboney...if you still have this costume, would you be willing to sell?? I would pay a good amount of money for this! My son would be in love!! Great job!!!! What is the Weapon made of? This costume is great! 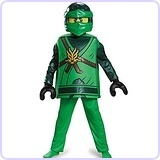 I search so long for a costume for my son..He is 8 and a great ninjago fan. Would you concider Selling it? Or Making another to sell? Im very interested in a costume like this but dont know where to find one. And Im not as talented as you are to make it. Could you please contact me? I have a few construction questions. I am in the process of making Zane for my son's birthday party in 2 weeks. i want to know how the legs were made and the mask. Thank you.